The Indiana Department of Transportation announces signal improvements to numerous intersections along US 30 in both Whitley and Kosciusko counties. Beginning on Monday, April 6, Shambaugh and Son of Fort Wayne is scheduled to begin the $1 million modernization project near Etna Green in Kosciusko County, moving east along US 30 toward Fort Wayne. The project consists of new signals heads, cabinets and other upgrades designated for each area and the addition of flashing yellow arrows on left-turn signals at select intersections. Motorists should expect to encounter temporary daytime lane restrictions in all locations. The project will finish in Fort Wayne, with completion scheduled for late June. Intersections in Kosciusko County receiving new FYA signals include: US 30 at SR 19; US 30 at CR 150W (Silveus Crossing); US 30 at Springhill Road; and US 30 at Parker Street. Intersections in Whitley County receiving new FYA signals are: US 30 at SR 5; US 30 at Lincolnway Road; US 30 at Armstrong Drive; US 30 at CR 300E; US 30 at CR 600E; and US 30 at CR 800E. With the new flashing yellow arrow configuration, drivers will still be able to make protected left turns with a steady green arrow. A steady yellow arrow will follow that phase, and then a steady red arrow for a short time segment, one to two seconds. At that point, a flashing yellow arrow will allow left turning traffic to proceed, while the opposing thru traffic has a green light, after yielding the right-of-way to oncoming traffic. The FYA will be followed by a steady yellow arrow and then a steady red arrow again. The steady yellow left turn arrow retains its standard meaning that the signal is about to change to a steady red arrow, and drivers should prepare to stop, or, if they have already entered the intersection, they should complete the left turn when oncoming traffic has cleared. 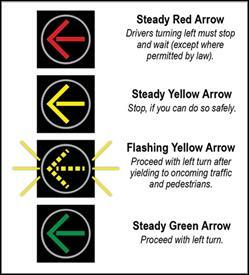 More information about the flashing yellow left-turn arrow is available on INDOT’s web site at www.in.gov/indot/3202.htm.